Pack up your trunks and head to Camp Rolling Hills for a wild, tune-filled summer of campfires, bunk beds, and treasure hunts (for missing underwear, that is). From learning a new sport, to discovering musical talent, to finding first love, these 12 tweens are off on an eight-week adventure that will forever change their lives. 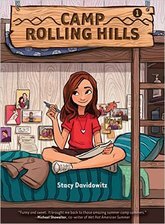 At Camp Rolling Hills, it doesn’t matter if you are a bookworm, a jock, a tomboy, or a girly-girl because true friendships are made when all the rules are broken. After all, there is a different definition of cool at camp. Camp Rolling Hills is a family friendly musical suitable to be performed by teens, adults, or both. Written for an ensemble cast of 8 men and 8 women (6 boy campers, 6 girl campers, their counselors, and the directors--a kooky husband-and-wife duo) with plenty of flexibility for an optional unlimited ensemble. Jamie Mann (Billy Elliot); Jillian Louis (It Shoulda Been You); and many more! Finally, it's summer! Stephanie—aka Slimey—has been counting the days until she can return to her favorite place in the entire world, Camp Rolling Hills. And this year she's especially happy to be back—she'll have eight blissful weeks away from home, where life has been decidedly rocky. New kid Bobby, on the other hand, is pretty sure he's in for the worst summer of his life. He does not understand his weirdo cabinmates, the group singing, and the unfortunate nicknames (including his: Smelly). But he does understand Slimey, and the two soon fall in crush. This summer might not be so bad after all! But then a fight sets off an epic, campwide, girls-versus-boys prank war. Bunks are raided! Boxer shorts are stolen! And it's up to Slimey and Smelly to keep the peace. ​There's only one thing Melman loves more than soccer: her summers at Camp Rolling Hills. So she's pumped to be back—until she realizes her bunkmates have gone totally boy-crazy over the school year and plastered their cabin in pink. Pink posters, pink t-shirts...it seems that the only not-pink thing in the cabin is Melman herself. That is, until she's given a dare in front of the entire camp: wear a pink princess dress. For Three. Whole. Days. Steinberg's summer gets off to a rough start, too, when his robot (usually his area of expertise) blows up during a camp-wide robotics contest. Steinberg might feel like a loser at home, but camp's supposed to be his place to shine. Steinberg without robots? Melman in pink? This whole summer feels turned upside down! To set things right, Steinberg and Melman team up and hatch a plan that involves hamburgers, bar mitzvahs, and drag. Summer's almost over, which means one thing and one thing only: It's Color War time! Color War is the event of the summer, a massive camp-wide competition that divides the campers into two teams: Blue and White. All of the upper campers are hoping they'll be selected as Lieutenant, a team leader position and a huge honor. Jenny's convinced she’s got Lieutenant in the bag, being a “Popular Girl” and all. And Play Dough sure hopes he does, too—members of his family have been White team Lieutenants for generations, and he doesn't want to disappoint them. But when assignments are announced, both Jenny and Play Dough are in for a big surprise. With the entire camp now amping up for an all-out war, can they overcome crushing expectations and lead their team . . . to victory? The gang’s back for a very special summer at the Hills—the camp’s 50th anniversary! Wiener is especially excited to be back, because his little brother Max is finally coming to camp. Wiener can’t wait to show Max the ropes (and show Max what a cool big brother he is), but there’s a snag: as the smallest and youngest in his cabin, Wiener gets teased a lot, and it doesn’t take Max long to realize Wiener might not be the Camp Legend he made himself out to be. Meanwhile, inspired by a big change at home, Missi is determined this summer to be 100 percent true to herself—no more pretending to like celebrity teens just to fit in! But when she catches the eye of a suave exchange student, she starts to wonder whether she was better off playing it cool.